Goal Zero Guide 10 Plus – Is This the Answer to Your Backup Power Woes? Being outdoors means that you have no choice but to give up certain conveniences and amenities that the modern lifestyle affords us. Back in the day, it just used to be you, your equipment, and the vast expanse of nature. However, times have changed and technology continues to evolve which in turn gave birth to the modern outdoorsman. These days, it’s common for hikers, campers, backpackers, fishers, hunters etc. to carry their smartphones, GPS, and other gadgets as they challenge the great outdoors. If you’re someone who can’t do without your gadgets while in the wild, you need a reliable, portable power source. In this case, you can’t go wrong with a solar recharging kit. Today, we’re going to review the Goal Zero Guide 10 Plus and find out if it’s a good backup charging solution for your outdoor adventures. 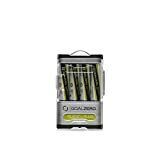 Goal Zero is a company known for its portable power devices that are designed to power everything from smartphones to a complete mobile home. The Guide 10 Plus is actually one of their smaller and more affordable products. 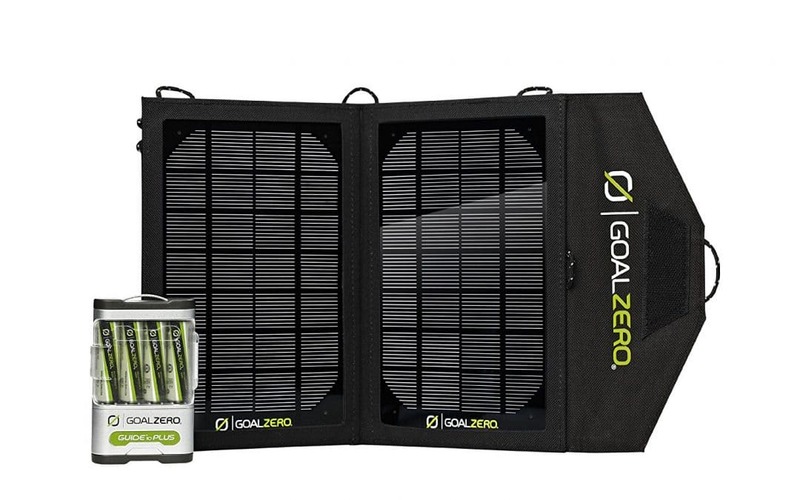 This Goal Zero solar kit consists of two separate components: the Guide 10 Plus Battery Recharger and the Nomad 7 Solar Panel. Goal Zero products are generally known for good design and construction – the Goal Zero Guide 10 is no exception. The recharger itself sports a clean utilitarian design but still manages to have a rugged build quality. Upon holding it in my hands, you know that this thing can stand up against the harshest environments. In the looks department, the Guide 10 Plus looks like your traditional battery recharger but you won’t find any plugs in the unit. What makes the kit unique is that it’s powered by rechargeable AA batteries. The batteries are then recharged by hooking up the chassis to the Nomad 7 Solar Panel. This is what makes the Guide 10 Plus perfect for emergency applications to outdoor adventures. The Guide 10 is a very compact unit at 2.5 x 4 inches and weighing only 0.4 lbs, and that’s when the batteries are loaded. This helps with the portability and packability of the unit. The use the battery pack, all you need to do is plug your device into it. I’ve tried charging my Samsung Galaxy S8 through the USB port and it did charge the device just fine. As for the charging speed, it should be about the same as charging your device into a computer. So for every 10 minutes, I get about 10% charge which is pretty good. Alternatively, you can just charge the AA batteries and use it to power your other gear like a flashlight, radio, headlamps, etc. There’s also an insert if you wish to charge AAA batteries. As for the solar panel, I was able to charge the Nomad 7 as long as there’s direct sunlight. The panels can charge the Goal Zero Guide 10 in about 3 to 4 hours. On the other hand, charging the Guide 10 on a computer via USB took about 6 hours. My only complaint is that there’s no way to charge the unit directly to an outlet. However, this is easily solved with a USB adapter. The kit costs approximately $120 which include the Nomad 7 Panel, Guide 10 Plus Recharger, 4 AA batteries, a 12V cigarette adapter, and an AAA insert. If you are going to break down the price, the panel cost about $80 and the recharge for approximately $50. Personally, I think the price is very reasonable for a reliable way to recharge my devices while on-the-go. However, there are other comparable products that are much cheaper like the Anker 21W Dual USB Solar Charger which goes for around $60. The Goal Zero Guide 10 is a great product that has mostly what I need from a portable charging solution. It’s lightweight, versatile, affordable, and easy to use. For personal use, the Goal Zero Guide 10 Plus is an easy recommendation. Otherwise, if you need more power for more intensive uses, there is an REI solar panel that you can use. The usefulness of this unit will depend on your circumstance. I can’t imagine myself taking this kit during backpacking but trips that require more electronics, you can expect this kit to be in my bugout bag. What do you think of this Goal Zero 10 Plus Review? Would you grab this kit for your next outdoor adventure?